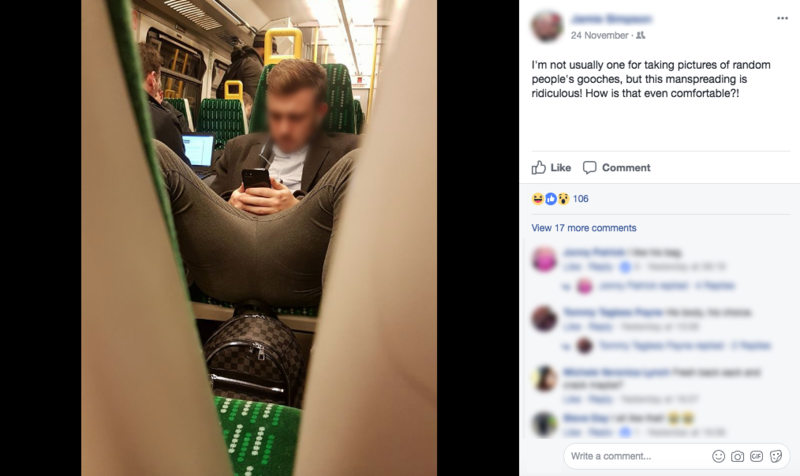 A passenger on a Midlands train took ‘manspreading’ to a whole new level recently after being captured deeply slouched into his seat while with legs spread far and wide across two additional seats. The young man, immersed in his phone with earbuds plugged in, was photographed by a fellow passenger who found his extreme position and spread perplexing. The image was snapped on a late-night Cross City line from Birmingham to Lichfield. In August, London Midland launched new regulations reinforcing old bylaws, in response to complaints from train passengers about passengers putting their shoes and feet on seats. According to the train operator, the crack down is in response to an abundance of complaints from other passengers and sees those caught reported, cautioned and potentially prosecuted in court. Head of revenue protection and security at London Midland, Darren Hanley said: “The railway bylaws have always existed but for many years they have fallen out of focus by most train companies. London Midland staff have since been handing out cautions to any passengers putting their feet on seats, smoking e-cigarettes and riding bicycles on train station platforms. “Manspreading” is the described as a practice where a man adopts a sitting position with his legs wide apart, encroaching on an adjacent seat or seats. “Nobody likes dirty or wet seats, please keep your feet on the floor. Please remember, this is an offence under the Railway Byelaws. We want to keep the train environments as clean and pleasant as possible. Would you want to sit on a dirty or damaged seat? “Manspreading”, on the other hand, isn’t illegal, but does still leave many divided on the issue; with some feeling the phrase itself is problematic, while others feel challenging the behaviour is a feminist issue. 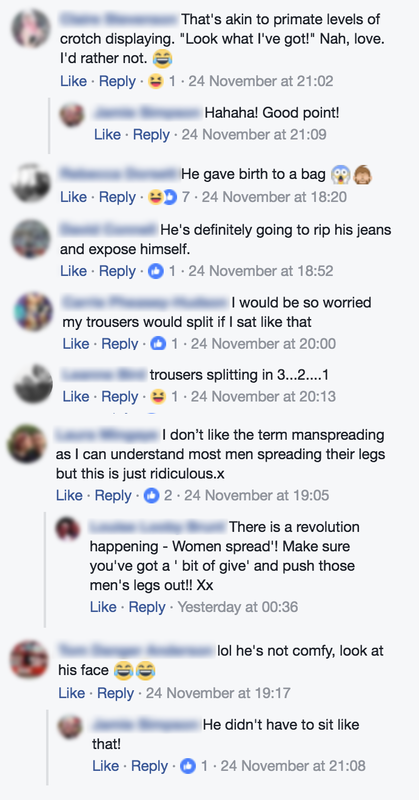 Terminology aside, the practise of extreme spread amongst men (and not uniquely so) continues. Manspreading: It's a space issue. 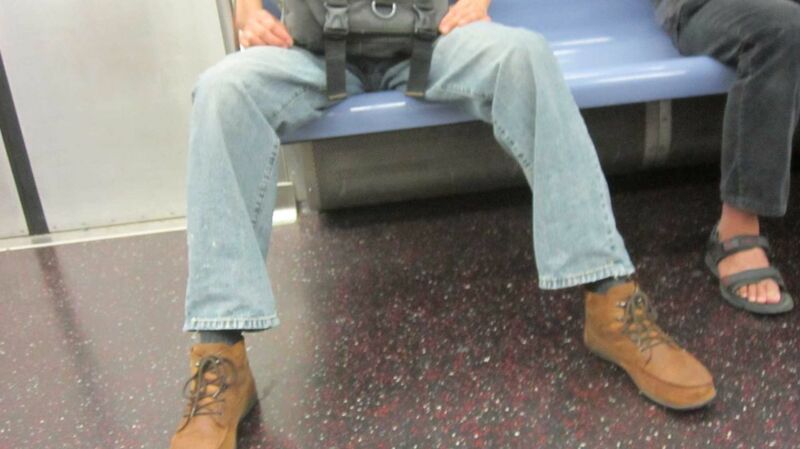 Manspreaders of the world, take note.